Who expected a £1 clearance sale to be this good? 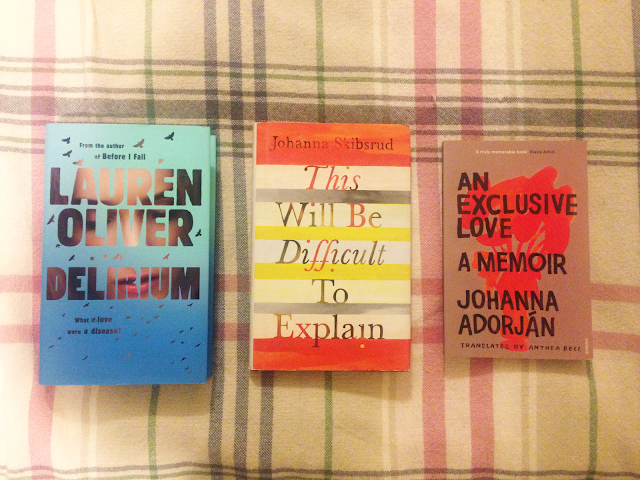 Delirium by Lauren Oliver - A young adult dystopian novel, the first in a series, set in a world where love is banned. It causes madness and delirium and must be treated as soon as the symptoms are first spotted. Very good reviews by people I follow on Goodreads, as well as the general Goodreads community. The series finished in 2013 so if I enjoy it I can take my time without worrying about looking release dates. This Will Be Difficult to Explain by Johanna Skibsrud - I picked this up after only reading the blurb (it's a collection of loosely connected short stories, to summarise quickly), and upon checking Goodreads I can see that it has been very poorly received by reviewers on there. However I'm still curious and will happily give it a go. An Exclusive Love by Johanna Adorján - Somehow in one haul I have picked up two books by people called 'Johanna'. This is a memoir is Johanna's grandparents, very much in love with very happy lives, who one day, together, took their own lives.